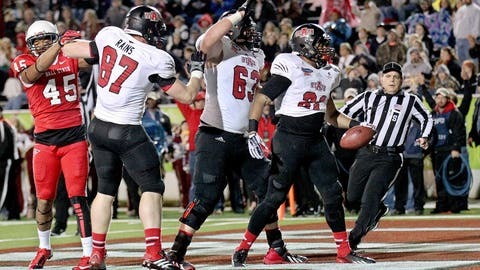 Sirgregory Thornton (21) and teammates celebrate an Arkansas State touchdown. The GoDaddy Bowl was kind of like those extra slices of pizza left over from New Year’s Eve. You went to the refrigerator hungry for a snack, started poking around and got a nice surprise when you found something you’d completely forgotten. After the NFL’s Wild Card Weekend had concluded, Arkansas State and Ball State met in Mobile, Ala., on Sunday night for the last bowl game before Monday’s BCS National Championship Game. It went down to the final seconds, with Arkansas State blocking a potential game-tying field-goal try at :02 of the fourth quarter for a 23-20 victory. The Red Wolves won for interim coach John Thompson, who – as we were constantly reminded by ESPN’s announcers – would not have a job after the game as new coach Blake Anderson takes over the program. Thompson was subbing for Bryan Harsin, hired by Boise State after the regular season. Last year, Thompson, the defensive coordinator, also had to step in as the bowl game head coach when Auburn hired Gus Malzahn. The year before that, Arkansas State also lost its head coach when Ole Miss hired Hugh Freeze. We also heard how much of Arkansas State’s offensive trickery – odd formations, double passes off throwbacks – was a carryover from Malzahn’s one season as head coach. However, it seems doubtful we will see Malzahn running the signature play from Sunday’s game, perhaps the quirkiest of the entire bowl season, against Florida State on Monday. That would be the gadget with the decidedly un-PC name of "Hide the Midget." It is so named because the bunched-up formation serves to obscure wide receiver R.J. Fleming, listed at 5 feet 9, who crouches behind the offensive line and receives the ball while everyone moves right before and he scoots around left end. But that description doesn’t do the play justice. And what made it even better: The trick play set up a touchdown run by Sirgregory Thornton. If only Thornton were more like Fleming’s size, the play could be called "Hide the Knight." In addition to executing fakery, Arkansas State had to overcome the loss of its starting quarterback, Adam Kennedy, who was out of uniform for the second half, as Fredi Knighten took over. Knighten went 15 of 20 passing for 115 yards and rushed 19 times for 97 yards. After Ball State had taken the lead on a touchdown with 1:33 left in regulation, Knighten directed the Red Wolves to a go-ahead TD in just 1:01, covering 59 yards in five plays. The loss extended Ball State’s NCAA-worst bowl record to 0-7. Will that make its way into Monday’s monologue for the school’s most famous alum, David Letterman? The http://t.co/nbETusawAC Bowl doesn't start for 90 minutes, but Danica Patrick is already 2 laps down.